In Greece, okra are usually cooked “laderes” which is today’s vegan dish cooked with olive oil, in a tomato sauce. However, I have also cooked them with sundried tomatoes as well and they are very delicious. Okra is a summer vegetable and in Greece they appear in the farmers’ market from June to late September. Another popular way of cooking okra is baked in the oven, with chicken and feta. I have recently made them with fish (pollock), cooked on the stove top and they were amazing! Okra have tiny spines, so if you want to avoid getting itchy, wear latex gloves when preparing them. With a sharp knife cut the stem in a circular manner leaving a small cone on the top, without cutting through and revealing the seeds. Wash them thoroughly and drain. Put them on a large tray in one layer and sprinkle them with wine vinegar (about 2 tbsp). Let them sit in the sun for about 1 hour. Cover them so that insects may not go on them. They are ready to be cooked. No rinse is necessary. This is how my mother used to peel them and they never got slimy. Put some salt in a small bowl ( 3 – 4 tbsp). With a sharp knife cut the stem in a circular manner leaving a small cone on the top, without cutting through. Dip the cleaned edge in the salt and place on a large tray lined with kitchen paper, in one layer. Let them sit in the sun for about 1 hour or more, covered with a tulle to prevent flies or insects from sitting on them. Rinse thoroughly and drain well before cooking. If you are in a hurry to cook them, pat dry on kitchen towel. I was looking for the vegen recipe of okra to link it to this recipe and I realized that I have never added the recipe. There was a time that I was writing recipes on other sites but did not post the same recipe simultaneously on ny blog as well. I wrote about okra on Group Recipes, years ago and it somehow, slipped my mind to post it here as well. 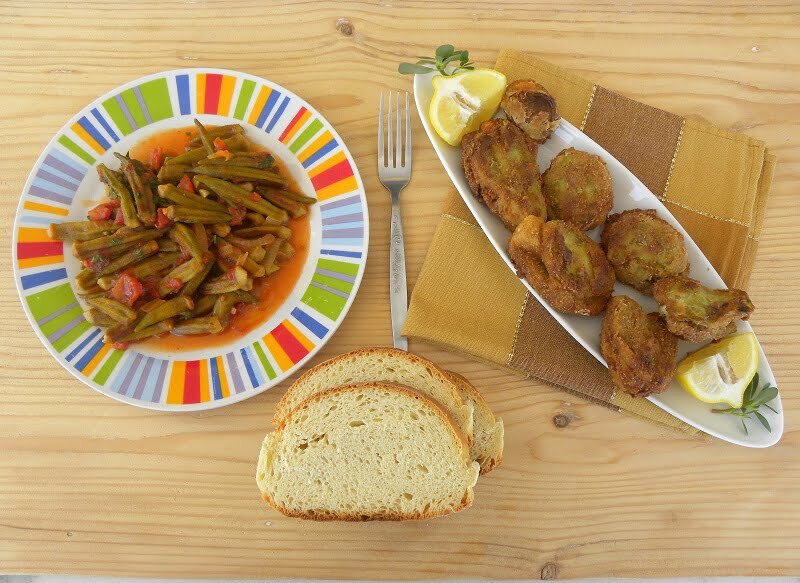 This is a classic Greek recipe of okra and is the one I usually cook for my family. This is an updated recipe on how I cook it today. The same recipe can be used with frozen okra. None of the above methods are necessary. Fresh okra is often maligned for being slimy, but if they are handled properly, before cooked, these small, green pods will become delicious when cooked! Peel stem of okra and sprinkle with salt. In a frying pan, heat the olive oil and slightly fry the okra. Remove them with a slotted spoon in a sauce pan. Chop the onions and fry them in the olive oil till slightly brown. Add the garlic and mix for a few seconds. Add the tomatoes, vegetable bouillon, vinegar, salt and pepper and water. Simmer for five minutes and put the sauce on top of the okra. Simmer until the okra is cooked (without stirring, as they will break) and until the sauce thickens, for about 20 – 30 minutes. Occasionally tilt the pan so that the okra will not stick to the pan. Just before the end mix in the parsley. During August, I made the above Okra Stew and when preparing them, I made the video. As during summers I do not have much free time due to the cooking classes, I have updated the recipe today. The next day I had a plate of leftover okra stew, so I turned them into this delicious Pasta dish. If you have some leftover stewed pasta, combine them with some pasta and sausage and make this delicious dish in just twenty minutes! Coook the penne, according to package instructions. Simultaneously, heat the olive oil in a non stick frying pan and sauté the onion until translucent. Add the garlic and cook for a few seconds, until fragrant. Add the sausage and sauté until cooked. Add pepper and the wine and cook until the alcohol evaporates. Add cooked okra and grated tomato and cook until the sauce thickens, for about 10 minutes. Remove from the heat and mix in the parsley and basil. Add the cooked pasta and mix. Serve with myzithra on top. It looks very interesting. This is the first time I know that we can cook Okra like this. Thanks for your article! I love to teach healthy vegetable tips thanks is a good share….